After extensive renovations, West End's iconic pub, The Boundary Hotel, has returned as a multi-purpose destination for dining, events and entertainment. If you would like to book an inspection of our new venue, or request a copy of our function party packages, please click the buttons below. Celebrate your next birthday party at West End’s iconic Boundary Hotel. Whether you’re planning a big celebration or small gathering with friends for your next birthday, we have the function space to match. Discover our six function areas available to hire for birthday parties, including a rooftop bar, beer garden and four private function rooms. We are experienced in catering for all milestone birthdays and can host celebrations ranging from 10 – 1,000 people. Host an intimate meal with friends and family or stand up and celebrate on the rooftop bar with our all-inclusive packages and zero-cost room hire. Request our functions packages today to find out more. The Boundary Hotel has been a staple of West End for over 150 years. This historical building has undergone extensive renovations and has reopened as a multi-purpose venue, ideal for hosting birthday parties from small intimate dinners to milestone celebrations with up to 1,000 guests. This venue features six new function spaces including a rooftop bar, beer garden and four private function rooms. Celebrate with friends and family with one of our premium catering packages, featuring fresh local fare, craft beers and top quality wines. 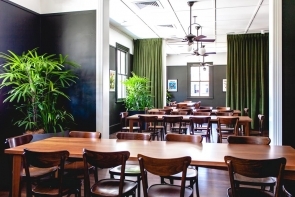 The newly renovated Boundary Hotel is set to quickly become the hottest spot in town with an unbeatable location on the main street of one of Brisbane’s most up and coming suburbs. No matter what you have in mind for your birthday party this year, there is no better place to host it than the new and improved Boundary Hotel. If you would like to enquire about the availability of key dates for your birthday party, please complete the form below and a member of our team will be in touch with you.